At St. James’s Branch we would be delighted if you are interested in volunteering, whether you’re a member or not. Fundraise – we participate in the annual Royal British Legion Poppy Appeal and the more helpers we can attract, the more money we can raise! 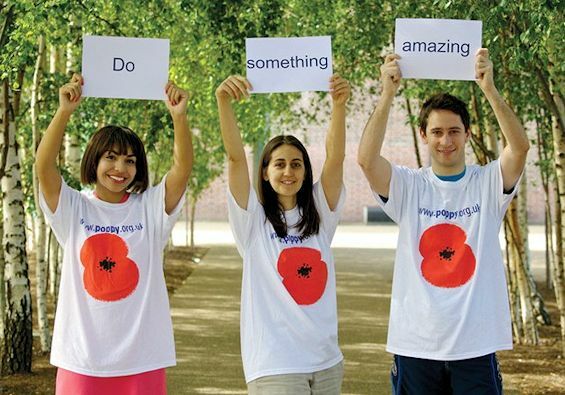 Participate in sponsored events – run a marathon, swim a mile, bake a cake, ride a bike – organise your own sponsored event and raise money for the British Legion. Find out more on the Royal British Legion website. Anything else – if you have an idea or a particular skill, or just want to lend a hand, please get in touch to discuss it. Take part in all of the above. Shape the future of The Royal British Legion’s largest branch (circa 20k members) and influence the decision makers leading the UK’s largest Armed Forces Charity. Enhance your CV; employers appreciate the dedication and drive it takes to be a volunteer. Develop your interpersonal skills; debating, resolution and listening to all arguments/opinions have a major impact on your ability to understand new or different concepts. Be heard; new successes, initiatives and perspectives are the lifeblood of a successful team, your ideas will help. Learn; from veterans, business owners and charity workers, an appreciation of learning from history, taking the best ideas forward and finding new opportunities. Enjoy new friendships; our current team are a diverse bunch of characters, who, whilst taking their roles very seriously, never, take themselves too seriously! Do contact us now to find out more about supporting the British Legion. Read more about fundraising for the British Legion on the National website – click here.